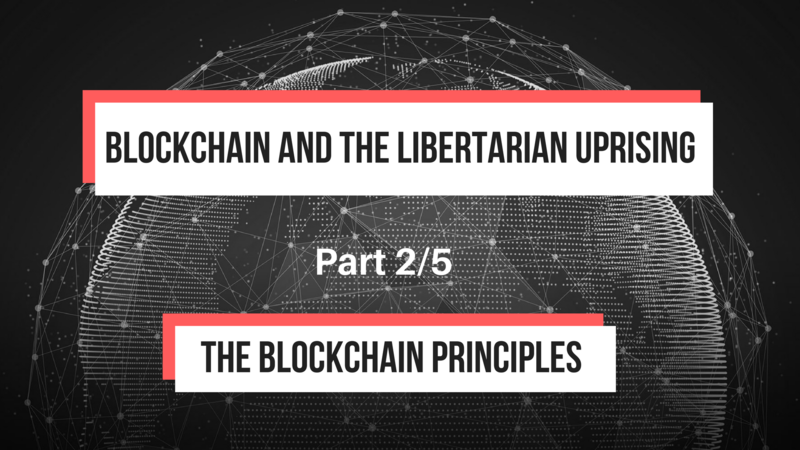 This is part 2 of a 5 part series adapted in blog format from my senior research paper titled “Blockchain and the Libertarian Uprising“. These are the disruptive key features offered by blockchain technologies. (Imagine a similar list, “Design principles of the Internet Economy” with features like instant communication, information commoditization, universal access, etc.) Each principle will be explored further with reference to bitcoin’s blockchain structure. Bitcoin maintains integrity across a scalable network by relying on the infallible nature of mathematics. Every step in the process is mathematically verified and any attempt to commit fraud at any point in the process will be detected by the rest of the network and rejected (Source). In this way, blockchains can create automated consensus about what happened in the real world. In the case of bitcoin, the millions of miners on the network must come to an agreement about “who” sent “how much” to ”who”. Bitcoin is not owned by an individual, corporation, organization, or government. Bitcoin belongs to everyone who uses it and rewards everyone who works on it (Source). This means that there is no single point to attack, no individual to prosecute and no corporation to shut down. The entirety of bitcoin is sustained by the millions of wallets, nodes, and miners all acting interdependently over the internet. No single entity can shut down bitcoin or enforceably ban its operation or use (Source). The bitcoin blockchain protocol perfectly aligns the incentives of everyone involved (Source). Merchants are incentivized to accept bitcoin because transactions can settle in minutes rather than days (Source). Users who value anonymity are attracted as well as those who regularly send international payments (remittances) because bitcoin bypasses currency exchanges who can charge hefty fees. Miners are incentivized to strengthen the network for bitcoin payouts. The truly paranoid and heavily invested are incentivized to maintain a complete copy of the blockchain (and become nodes) to make absolutely sure their bitcoin is safe in the event of a network malfunction or massive attack. Even attackers are incentivized to strengthen the network. For the amount of computing power it would take to overwhelm the bitcoin network and successfully write a fraudulent transaction on the bitcoin blockchain, it would be much more profitable to use that computing power to earn bitcoins by mining (Source). If a significant portion of miners go offline, the payout for new miners increases (Source). Governments are even incentivized to support bitcoin or at least refrain from banning its use. When China’s authoritarian government declares its plan to enforce its 2014 ban on bitcoin, its people flock to the cryptocurrency in droves (Source). Enforcing such a ban is nearly impossible without targeting each and every individual using bitcoin. “Like holding a handful of sand: the harder [governments] squeeze, the quicker it slips away” (Source). Coin-based blockchains like bitcoin create value to incentivize its support and growth. Everyone using bitcoin must use secure protocols. Encryption makes up the “crypto” in “cryptocurrency” and encryption is used at every step to ensure data is only readable by the parties that data is intended for. Damage as a result of an individual’s recklessness is limited to that individual. There’s no single point of failure. Before bitcoin, individuals needed to trust a central authority like a bank or PayPal to send money electronically. Bitcoin eliminates the need to trust another individual. As such, it eliminates the need to know the other’s identity. It is sometimes possible to trace a bitcoin address to an individual through some detective work. It is also possible for an individual to remain anonymous while using bitcoin through various external methods. Other cryptocurrencies, like Monero, have discovered how to create truly anonymous identities using blockchain (Source). Blockchains allow the possibility for transacting information with anonymity and privacy in a world where individual privacy is being encroached at every level by governments and corporations alike. An individual’s right to ownership of his or her bitcoins is recorded on the bitcoin blockchain. It is openly transparent for anyone to see. This makes everyone’s right to ownership of his or her bitcoins apparent and enforceable. Blockchains can record records of any kind in a way that is permanent, apparent, and unalterable. Finally, bitcoin is inclusive; it can be used by anyone with access to a method of sending data. Although most people use computers and smartphones to transact with bitcoin, the bitcoin protocol is agnostic about how it receives transaction data. This allows individuals in developing countries to transact bitcoin using text messages from a decade old flip-phone (Source). Bitcoin’s inclusion principle makes it accessible to everyone without discriminating against credit history or economic status, opening the door for the estimated six billion people worldwide with no access to banking (Source). Remember that cryptocurrencies are a very narrow use case of blockchains. These seven principles are not limited to bitcoin but rather are made possible by the blockchain technology that underpins it.